The systemic violence encountered throughout the migrant route in Mexico is exacerbated by anti-immigrant enforcement policies backed by the U.S. government, fueled by the Mérida Initiative, and paid for by the people of the U.S. and Mexico. Pueblo Sin Fronteras stands in solidarity with all refugees who exercise their right to seek a life free from violence. We accompany refugees in their journey as human rights observers and offer information about their legal rights, including those defined in the 1951 Refugee Convention and its 1967 Protocol, and the domestic laws* intended to implement them. Refugees lead this movement. Both the United States and Mexico have signed international agreements that uphold the rights of refugees, including the right of non-refoulement. Their asylum processes are punitive and unjust. These governments refuse to honor their commitments to refugees’ rights and instead cruelly incarcerate and deport them, often to their deaths. The unprecedented number of Central Americans who have joined the current refugee caravan and the high percentage of people fleeing Honduras in the group are the result of multiple political crises in the region provoked in large part by the policies of the U.S. government. The U.S. support for the Honduran military coup of 2009 and the electoral coup of November 2017 have intensified military and political repression, insecurity, and physical and economic violence. Hundreds of Hondurans have fled their homes and joined the Refugee Caravan in order to seek refuge in Mexico or the U.S. 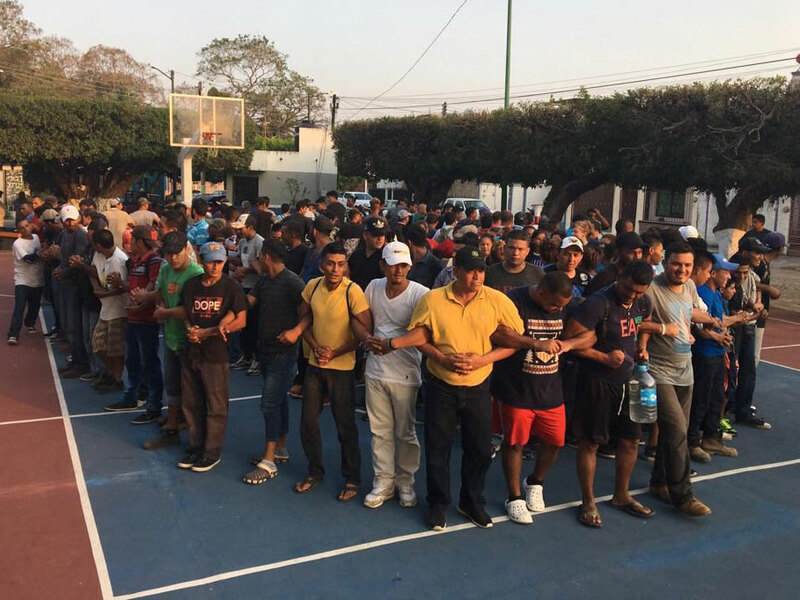 They, along with their fellow caravan members, have organized and developed a network of mutual support within the caravan to protect themselves from dangers such as extortion, robbery, murder, sexual assault, torture and deportation without a right to seek asylum, which virtually all those who journey alone confront. The systemic violence encountered throughout the migrant route in Mexico is exacerbated by anti-immigrant enforcement policies backed by the U.S. government, fueled by the Mérida Initiative, and paid for by the people of the U.S. and Mexico. Mexico’s 2017 Internal Security Law criminalizes human rights defenders and further endangers refugees and asylum seekers fleeing for their lives. As word of the size and causes of the caravan has spread through networks of solidarity, right-wing white supremacists have responded by threatening and calling for violence against its participants and supporters publicly in the news and on social media and personally with hate-filled phone calls and emails. These threats have gone so far as to include calls for militias and Border Patrol agents to open fire and even carry out drone strikes on caravan members, among them children as young as one month old. On April 1st, the U.S. President opportunistically invoked refugee caravans as a pretext for threatening immigrants already in the country, specifically DACA recipients, with a so-called “Nuclear Option” to remove their protections from detention and deportation. Trump is trying to turn Central American refugees and other immigrant communities against each other, and use them as a bargaining chip with Mexico. In the face of this bullying and these threats of mass violence, we continue to stand in solidarity with displaced people of all races, ethnicities, creeds, abilities, and gender and sexual identities. We invite all those who envision a world where human rights are honored to join us. *Title 8 Section 1225 of the U.S. Federal Code establishes that any noncitizen who fears returning to their home country has a right to seek asylum in the United States in order to be protected from persecution and violence. Article 11 of the 2011 Law of Refuge, Complementary Protection, and Political Asylum of Mexico similarly establishes the right of foreigners fleeing persecution to request recognition as refugees. New shirts and other stuff. Support Enough is Enough: here.